After undergoing several tests, LeBron James took the court last night to lead the Miami Heat to a 106-87 win over the 76ers. James scored 27 points despite his three-game break following a hamstring injury. The Heat won their game despite the absence of two injured players- Dwayne Wade and Chris Bosh. Dan Ellis, goalie for the Carolina Hurricane, didn’t start in yesterday’s game against the Florida Panthers. He did end up playing though, and helped his team earn a 3-2 victory with 19 saves. Ellis explained that his initial reluctance to play was due to an illness. Goalie Cam Ward replaced Ellis in the beginning of the game, but was taken down during the second. The extent of his leg injury was unclear after the game. This year’s Super Bowl started out rather dry, with the 49ers trailing behind the Ravens 21-6. The half time show featured a disappointing performance from Beyonce, as well as a brief visit from Destiny’s Child. To top it all off, power was lost at the Mercedes-Benz Superdome for a total of 34 minutes, making it hard for television viewers to stay focused. Evan Burschkopf, CEO of restaurant-bar Zarsha Leo, expressed gratitude to his staff for being quick on their feet. Despite its slow beginning, this year’s Super Bowl managed to build up some serious momentum. The first half set the precedent for an equally dull halftime performance by Beyonce, which culminated in a half-hour blackout. Conspiracy theorists believe the league manipulated the situation to pump some fresh adrenaline into the game; whether this is true or not, the downtime was definitely enough to the get the 49ers back on track. Last night featured what was probably the most intense NFL game this season, with the Denver Broncos and Baltimore Ravens coming head to head and finally ending the game in a double overtime. Despite their best efforts, the Broncos lost to the Ravens 38-35. The NFL season is on the brink of the playoffs, with this year’s predicted Super Bowl champion team already out of the running. One of the best ways to stay up to date on the season, playoff news, athlete stats and expert projections is with a subscription to a sports magazine like ESPN through the National Magazine Exchange. This year’s 12 competing teams all have a lot to work on. The Denver Broncos, leading the league with an 11-game winning streak, are Peyton Manning’s ride to a complete comeback. Still he feels they are a work in progress. “I think we’ve done the best job of being the best we can possibly be in a short period of time,” he said. The Broncos have been given a little extra time to rally with a bye during the first round of the playoffs. However, the Patriots, Falcons and 49ers were all given the same opportunity. The Huffington Post explains the major weakness of each of the 12 competing teams. The Patriots also have some room for improvement, according to the Post. 18-year-old Nick Anderson manages the basketball team at the Academy of Holy Angels high school in Minnesota. Challenged with cerebral palsy, Nick has never been able to play. Never, that is, until this week. Though Anderson didn’t shoot, he handled the ball perfectly, helping his teammates achieve a 75-69 victory, according to the Star Tribune. Here are the highlights from this NFL season’s clash between the San Francisco 49ers and the Arizona Cardinals. 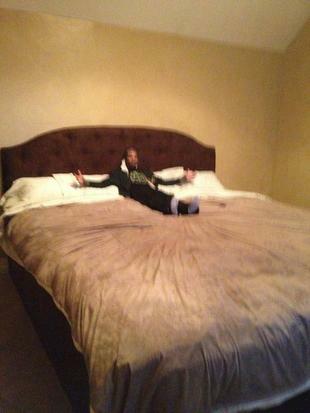 Al Jefferson’s jumbo-sized bed has made a giant splash in the media this month, with Mo Williams’ Twitter shot wowing fans and furniture fanatics alike. Measuring 12 feet by 10 feet, the bed is the size of the average bedroom. The set cost $23,287. Though the bed was certainly pricey, Jefferson is about to make $15 million this season. In comparison, the money spent is like a person with a $50,000 salary spending $77.62 on a bed; a steal by anyone’s standards! Following a disheartening offseason, Jets fans took a cautious approach to the team’s first game of the 2012 season. Their concerns were quickly alleviated by Sanchez though, all controversy regarding Tim Tebow pushed aside as he led the New York Jets to a 48-28 victory over the Buffalo Bills at MetLife Stadium.